Episode 2 of Kuragehime, “Sukiyaki Western Matsusaka” (スキヤキ・ウエスタン・マツサカ), starts out from the end of the previous episode. Tsukimi is desperately trying to hide the existence of a fashionable person from the other residents of the Amamizukan, presumably fearing that it might end up with her being kicked out. It’s even worse that the person in question is male, as Tsukimi’s query to the reclusive Mejiro about what punishment she should receive for what she poses as a hypothetical situation is death. Too bad for Tsukimi that she is doing a spectacularly bad job at trying to hide her unwanted guest. Fortunately, only Chieko and Mayaya remain in the building among the non-reclusive residents, and Tsukimi eventually manages to get her guest outside without being discovered. Although perhaps Tsukimi should be much more worried about how her leaving guest mentions how he likes the atmosphere of the Amamizukan. Tsukimi feels a lot more relaxed as things go back to the normal routine, with the other residents fantasize what they could do if they spent the same amount of money Tsukimi spent on the aquarium for Kurara. And the Amamizukan residents go out for groceries to prepare for the weekly pot dinner party. Here we get to see that Banba is an excellent optical meter for judging the quality of meat, which at least gives them the consolation of fantasizing about the high quality beef displayed while having to satisfy themselves with discounted beef. Too bad yet again for Tsukimi that the dinner party isn’t as festive as usual. In fact, too bad for everyone else, since her previous guest had returned to join dinner. 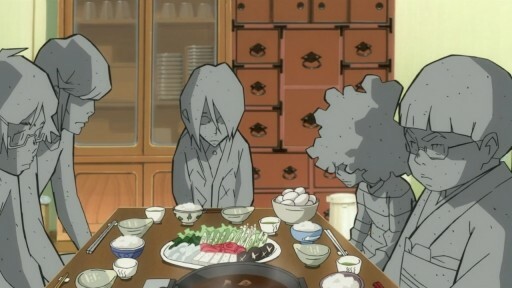 While Kuranosuke, our fashionable person, is having a jovial time at dinner and talking to everyone, everyone else has turned into stone in the presence of such a fashionable person. In fact, it gets so bad that a couple of the residents run away from dinner and Chieko is forced to ask Kuranosuke to leave. At least the residents don’t know that Kuranosuke is male. Tsukimi does get the shock of her life when Kuranosuke said he came back since he wanted to see her again; seems that this is something Tsukimi never expected to hear from another person. Tsukimi walks Kuranosuke back to his home, wondering why he came to dinner, and she gets to learn a little bit of what growing up must have been like for him as he reveals that he was always envious of a festive dinner among people, something that he rarely got to do with his own family. This makes Tsukimi think back to the times when she had happy dinner with both her mother and father, and she is about to tell something about it to Kuranosuke, although she’s interrupted when Kuranosuke is alarmed that his father is home. Tsukimi is utterly shocked when she becomes aware of her surroundings, as she finds herself at the front gate of an enormous mansion. Kuranosuke apparently doesn’t want to face his father while in crossdressing mode, either because it might spark another huge fight in a series of fights or because his father doesn’t know about his crossdressing. Fortunately for him, his older brother arrives, and while the brother is really unhappy about Kuranosuke’s crossdressing ways, he’s even more wary of letting the father know. Kuranosuke manages to convince his brother to get some high quality Matsusaka beef from the mansion kitchen, and back at the Amamizukan, manages to completely turn around the residents’ attitude towards himself, with Tsukimi being flabbergasted at how easily they were all bribed with good food. Next morning, Tsukimi receives the final shock of the episode when she notices Kuranosuke’s brother on the news next to the ex-transportation minister, Koibuchi Keiichiro (whom I expect is quite pleasing to Jiji’s eyes). And that’s on top of worrying about the residents ever learning that he’s male. It doesn’t look good for Tsukimi’s prospects of not getting an ulcer, considering how all the portents point to Kuranosuke moving into the Amamizukan (him being a crossdressing otaku, liking the Amamizukan, not being close to his family, and him being rich along with an increase in vacant land in the neighborhood). One thing I want to mention before finishing this post is that the title of each episode seems to be inspired by other television shows or movies, given how many movie references appear in the opening sequence. It’s clearly inspired by Tsukimi’s own imagination that sometimes ties into movies and such, even if the references haven’t appear too often in the episodes themselves so far. I might be wrong, but I have a feeling that this episode’s title is inspired by Sukiyaki Western Django .